Singapore-based KrisEnergy Ltd. announced Seadrill Ltd.’s West Cressida jackup rig spud the Mancharee-1 exploration commitment well in block G10/48 in the Wassana oil field, in the Gulf of Thailand. The West Cressida. 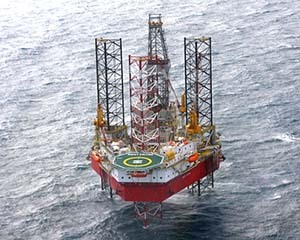 Image from Seadrill. Block G10/48 covers 4696sq km over the southern section of the Pattani Basin in water depths up to 60m. The Mancharee-1 well is located at 170ft water depth, with an expected total depth of 12,420ft. A series of stacked sandstone reservoirs of Miocene and Oligocene age will then be evaluated. The license contains two additional discoveries, Niramai and Mayura that are in various stages of development or appraisal.Mancharee-1 lies to the west of the Mayura oil discovery, which requires further appraisal. G10/48 also holds the Niramai oil accumulation, which lies to the north of the Wassana oil development. The plan for the first phase of the Wassana oil field involves 12 to 14 development wells connected to a fixed production platform. First production is expected to begin in 2H 2015 at a peak rate of 10,000bbl/d. Gross recovery from Phase 1 is expected to be 13.6MMbbl. 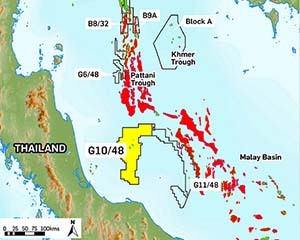 Map of block G10/48 in the Gulf of Thailand. Image from KrisEnergy. Mancharee-1 is the first exploration well to be drilled in G10/48 since KrisEnergy took over 100% of working interest of the block in May 2014. In 2009, KrisEnergy acquired a 25% non-operated working interest in Block G10/48, but acquired Mubadala Petroleum's 75% working interest and took over operatorship in 2014. In June, KrisEnergy contracted Shelf Drilling’s Key Gibraltar jackup for development, appraisal and exploration drilling in the G10/48 and G6/48 blocks. The contract will begin in January 2015 for a firm six-month term with an option to extend an additional two months. KrisEnergy announced it would not acquire the G3/48 exploration license in the Gulf of Thailand in February due to a then existing partner exercising its right of pre-emption over the acquisition.